The growth of eCommerce is stabilising (Ecommerce News 2016), which means retailers are having to try and get more from the relationships they already have. It’s no longer just about new customers – it’s about retaining and growing the loyalty of existing customers. Here we take a look at the most common and profitable ways online retailers get us spending more – emails that are carefully crafted tools aimed at retaining and growing custom. The retailer knows you’ll probably leave their site without purchasing anything – in fact, it’s estimated that 96% of people who visit an eCommerce site aren’t ready to make a purchase (Kissmetrics). But as long as the visitor leaves with an email subscription, the job is done. Getting people to sign up to receive emails means you can contact them at anytime to tempt them back. Take a leaf out of the retailer’s book and look at how you can make your email sign-up irresistible. 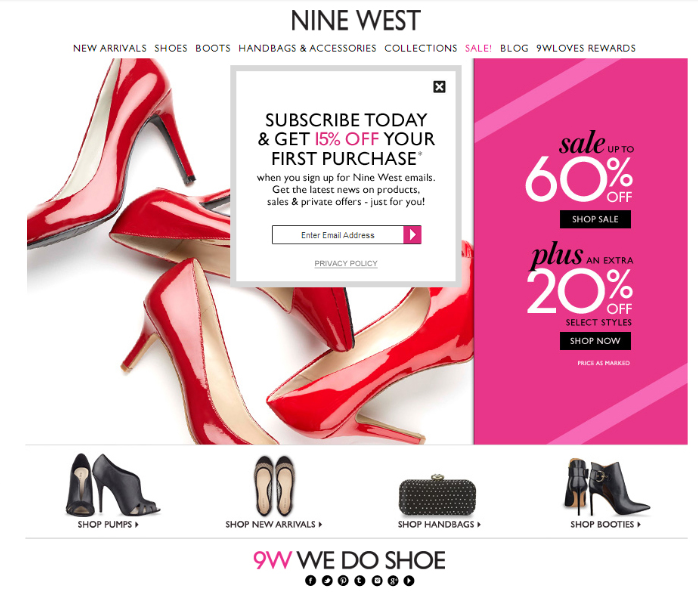 We love this example by footwear retailer Nine West. They clearly know the value of email and aren’t prepared to let the browser click-away without seeing it. They’ve even incentivised the sign-up with a 15% discount – a great way of prompting the first purchase quickly. The retailer knows it’s common courtesy to greet your customers but they don’t just stop at saying hello. Welcome emails generate four times higher open rates and five times higher click-through rates than a typical broadcast email (Experian, 2015). Customers are fresh to your site, interested and poised to make a purchase. Retailers don’t waste this opportunity – they make sure they always give a good first-impression. As Birchbox demonstrates, a welcome email shouldn’t be a hard-sell. There’s no reason to throw offers out straight away when the visitor has just subscribed and is clearly looking around. They gently introduce the brand and the possibilities to get them shopping. According to Baymard Institute, 68.8% of online shopping carts are abandoned (Baymard, 2015). This means cart abandonment campaigns are the secret weapon of the retailer in the battle to recapture those sales. Cart abandonment doesn’t just present a huge percentage of people you can contact again but also generates impressive stats. The typical abandonment campaign delivers a 48% open rate with 33% of these people going on to make a purchase (Econsultancy, 2013). Impressively the average order value from a cart abandonment email campaign is 58% higher than direct sales (Econsultancy, 2013). They’re often super-charged with tricks to get the customer to complete their order – the expiring promotion or limited stock, offers of free delivery, reviews or suggestions for future purchases. We think ASOS do a great cart abandonment email – it’s simple, impactful and tempts shoppers back without being desperate or giving away discounts needlessly. You don’t need to wait for visitors to abandon baskets to tempt them back. Widen your net by contacting people who’ve simply browsed your site and then left. Send targeted emails featuring what products they browsed with details of availability, offers and suggestions for alternative purchases. We love this example by J Crew – it’s simple, personable and impactful. So there you are – some great examples of how retailers keep us coming back for more. It’s clever use of email marketing to connect with the customer and gently nudge them along the path to making a purchase. And remember – whether you work in retail or not, the technology and principles behind these tactics can be applied to keep customers loyal, engaged and buying into their online relationship with you.